Seventy years ago this week, the United States used atomic bombs in war for the first (and so far only) time in history. It is an occasion to reflect on what that action meant and what it continues to mean for every person on the planet. Without getting into the debate over the morality or the military effectiveness of the bomb, here are some thoughts on the journalism of that fateful period. Here is a recent piece by me that ran on The Conversation (a terrific website in which academics are invited to write for non-specialists). It is adapted from my book Covering America. Here is the NYTimes own history of its role in the coverage. And here is the text of John Hersey’s masterful account of Hiroshima. 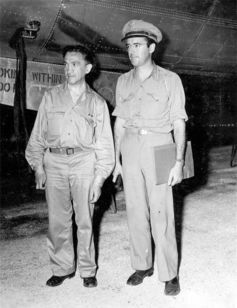 William Laurence (left) on Tinian Island before departing for Nagasaki. Although no hyperlink to The Conversation appeared on my copy of the email, I found it and it is a very thoughtful piece and a welcome remembrance of the brilliance of John Hersey. Sadly, subsequent journalists’ coverage of the atomic bombings has generally been by journalists more interested in applying their reasonable beliefs that the Vietnam and Iraq wars were driven by lies to the atomic bombings without regard for the facts. Consequently, we have claims that a demonstration of the bomb would have caused Japan to surrender, notwithstanding that even after Hirsohima and Nagasaki, some key Japanese leaders still opposed surrender (and that an inventory of only 2 bombs, of different designs because neither was regarded as sure to work, leaves scant room for demonstrations). We have reporters suggesting that negotiations might have produced a surrender without the bombs being used, avoiding mass deaths, disregarding that Japan was killing thousands of allied soldiers and civilians daily in China, the Philippines and elsewhere, which is why China, even at the height of its anti-American hostility, has not critized the bombings. We have reporters claiming using the bomb vs. Japan was racist, notwithstanding that it was developed to be used against Germany, but was not ready in time. What we do not have is journalists asking whether, given Japan’s mass atrocities in Nanking and elsewhere, mass enslavement of “comfort women”, use of biological and chemical weapons in China and Mengele-type “medical” torture of prisoners of war, there is any doubt that Japan would have gleefully dropped atomic bombs if only it had them.